For a bright and smart look, these long sleeve chef jackets are unisex and come in a wide variety of colours and sizes. Featuring a lightweight design with black capped press stud fastenings on a variety of bright colours or more muted tones. These professional long sleeve chef jackets keep you fully protected in the kitchen and are perfect for home laundry with drip dry and minimum iron properties. Made from 35% cotton and 65% polyester, makes these coloured short sleeved jackets long lasting and comfortable for everyday use. 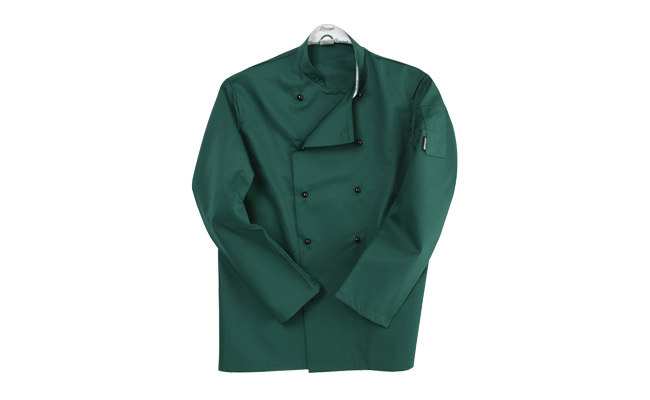 If you’re looking for something a little more eye-catching then you can opt for a blue chefs jacket or even a green chefs jacket- there are a number of statement colours to choose from in the range. Here at Pattersons Catering Supplies, we offer a complete range of high quality and professional chef clothing including chef jackets, chef trousers and chef hats.